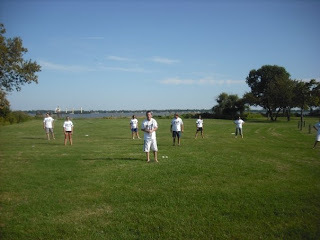 brian's family's annual crab feast/family reunion/whiffle ball game on labor day weekend this year. the whiffle ball game is always divided into guttenplans vs. non-guttenplans. our team had t-shirts this year, and i think it was the team unity that really allowed us our first win. the record stands at 4-1-1. great times!